There are not many recent novels about life in Iran. Somehow in the rush to write novels about the Middle East or other Muslim-majority countries, Iran has been left far behind while Iraq, Afghanistan, and Pakistan take precedence. Ali Hosseini has done western audiences a huge service by offering an Iranian perspective to age-old conundrums such as industrialization, war, and religion. 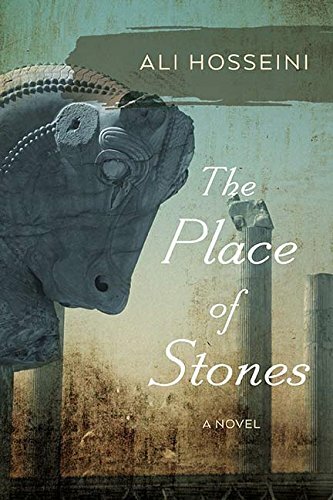 The Place of Stones is set in the plains at the foot of the Zagros Mountains, where families live simply as farmers and laborers. Hosseini’s prose is light but impactful, painting pictures in a deft style and allowing readers to perceive places that are not in front of them. Hosseini’s main characters are two young men named Haydar and Jamal, best friends and soon to be related through marriage. Jamal is the practical one, reigning in Haydar’s huge imagination as the latter dreams of finding Alexander’s hidden treasure in the mountains. There are rich descriptions of simple farm life and everyday antics of the village children, and ruminating discussions of how life used to be before machines arrived. Everyone in the village seems to be looking inward, envying the past and dreading the future. It seems as if their fears are well founded. A landowner decides to convert the areas where they farm into a brick factory, and the lives of the villagers are thrown into disarray. Haydar is upset and aggressive, leading to imprisonment. Jamal is more pragmatic, and decides to modernize. The entire village becomes a microcosm through which readers view industrialization. At the same time, Iran is going through a revolution, and this too affects the village in untold ways. Religious leaders with extremist ideas begin to visit, asking for men to join the army and fight in the Iran-Iraq war. It seems to Hosseini’s cast of characters that everything around them is threatening to shatter their peaceful, simple existence. The final affects of these humungous changes are not only widespread but deeply painful.